The mysterious Chinese tycoon has finally been arrested. But unless the shady global networks he exploited to make his riches are dismantled, other individuals will simply take his place. 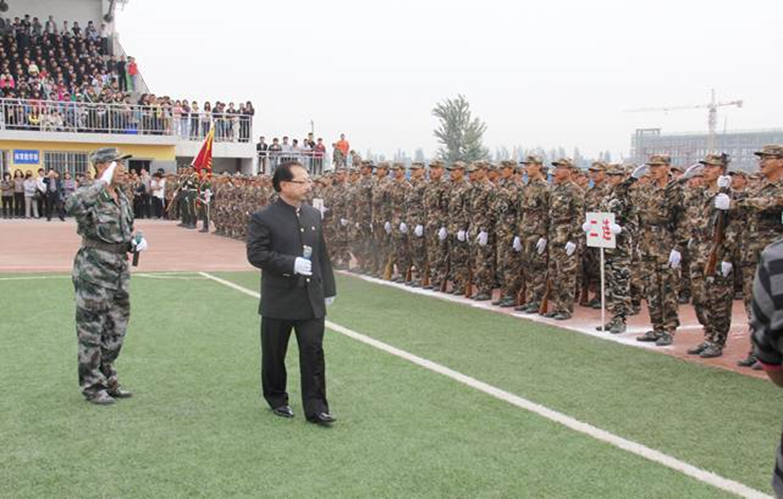 Sam Pa at a Chinese military training event at Yinchuan University. When Chinese investment tycoon Sam Pa was whisked away by authorities on the night of 8 October in the Sofitel in Beijing, it may have marked the end of his meteoric and somewhat unlikely rise from relative obscurity to one of the most influential Chinese businessmen in Africa. That evening, Pa was reportedly detained in connection with a sour deal with a powerful Chinese state oil firm in Angola that earned him huge profits. A former spy with a “fondness for women and fast cars” (according to his friends), Pa’s story captivated journalists and investigators the world over. He went from being a bankrupt arms dealer in the late 1990s to commanding a multi-billion dollar corporate empire in under a decade. The syndicate he formed in 2003, commonly known as the Queensway Group (named for the address of its Hong Kong offices), amassed holdings in the oil, mining, infrastructure, aviation, agriculture, and real estate sectors. Its holdings stretch from North Korea to Zimbabwe to Manhattan, and investigators on at least four continents have probed its operations. In many ways, Sam Pa operated in the tradition of war profiteers like infamous Russian weapons trafficker Viktor Bout. Like Bout before him, Pa is fluent in several languages, carried multiple passports, travelled in his own fleet of aircraft, and used at least seven aliases. He had the requisite arms trade credentials and high-level political contacts but used his connections to penetrate new markets and amass a more impressive plunder. Pa’s detention may mean that one of the most exploitative predatory investors that has ever set foot in Africa has reached the end of the line. But his exit will yield little long-term gains unless the system that allowed him to thrive in the first place is dismantled. Pa owes part of his success to powerful friends in Beijing. In 2004, Queensway formed China Sonangol, a joint Chinese-Angolan venture that would prove to be Queensway’s most important partnership. In 2005, Sinopec, one of China’s largest state-owned oil companies, served as guarantor for a $3 billion loan to China Sonangol from a group of private Western banks, enabling Queensway to jumpstart its operations in Angola’s oil and infrastructure sectors. Chinese state enterprises remain key partners in Queensway’s overseas ventures. Yet ultimately, those longstanding ties weren’t enough to shield Pa. For one thing, he’s long courted controversy, often partnering with dubious brokers like Roman Putin – a cousin of Russian President Vladimir Putin – who helped him win a contract to build a $1.3 billion bridge connecting Russia and Crimea just a few months after the controversial annexation of the Ukrainian territory. Pa often targeted resource-rich states with financially desperate or diplomatically isolated governments. In 2008, he invested hundreds of millions of dollars in Zimbabwe’s diamond sector during the country’s post-electoral crisis. Later, Queensway penned deals with Guinea, Niger, and Madagascar shortly after coups d’état in each country. In Pyongyang, he brokered deals with Office 39, a North Korean state agency involved in everything from counterfeiting to drug smuggling. Queensway’s projects in many of these countries have been marred by chronic delays, mismanagement, and allegations of graft. Some of Pa’s operations, however, crossed the line from morally questionable to unquestionably illegal. In 2011, Jon Swain reported Pa’s involvement in the smuggling of diamonds out of Zimbabwe and the trafficking of weapons to Cí´te d’Ivoire in violation of sanctions. In 2013, court records revealed that his companies made hidden payments to diplomats in North Korea and Mozambique, while additional investigative reports allege that he bribed high-level officials in several countries, including Nigeria, for access to lucrative oil concessions. In April 2014, the US Department of Treasury placed Pa under sanctions for providing assistance to Zimbabwe’s Central Intelligence Organisation, President Robert Mugabe’s secret police force that has become synonymous with state-sponsored violence. For years, Queensway drew criticism from Chinese diplomats too, who often issued statements distancing Beijing from Queensway’s activities and have warned companies and foreign governments about doing business with Pa. Talk, however, is cheap. Critics (myself included) have argued that throughout the Queensway Group’s reign, the Chinese government has failed to take punitive action against the syndicate’s leaders for their predatory practices and have often benefited from the Pa’s dealings. Pa’s relationships with senior officials and state enterprises, meanwhile, continued for years despite diplomats’ denunciations and abortive investigations. Staving off these detractors depended in part on top-cover from influential figures in Beijing, however, leaving Queensway vulnerable to changes in China’s political landscape. In retrospect, it seems clear Pa spent an enormous amount of time and energy on simply concealing his activities by engaging in back-room deals with like-minded kleptocrats and exploiting legal loopholes. This is no small task, when you consider the scale of his operations. Queensway’s business model, however, gave Pa plenty of opportunities to cover his tracks. Pa typically negotiated deals behind closed doors, and contracts pertaining its deals were rarely disclosed. Furthermore, in many of the places where Queensway operates, oversight institutions are weak and civil society and the press are stifled, meaning that the syndicate’s operations are rarely subject to public scrutiny. Queensway’s team of lawyers and accountants worked vigorously to ensure none of Pa’s aliases appeared anywhere on corporate records. Over time, Queensway’s corporate structure has become more and more complex. At one point, its operations in Zimbabwe’s diamond sector were channeled through the Hong Kong subsidiary of a Singaporean firm that was, in turn, owned by a series of shell companies in the British Virgin Islands. The ultimate owners of these firms remain a mystery. Trying to map Queensway’s corporate structure is simply dizzying. This allowed representatives from China Sonangol and China International Fund – Queensway’s flagship companies involved in everything from oil trading to property development – to deny links to Sam Pa, claiming he is just an advisor. This also impeded investigators and regulators who seek to delve into Queensway’s activities. Queensway also benefited from weak banking standards. Banks are legally bound to “know their customer”, but countless financial institutions are known to deal with firms that hide their beneficial owners. China Sonangol has accessed multibillion-dollar loans and maintained accounts with mainstream banks. This let Pa and his colleagues move money with ease. Queensway now owns billions of dollars in real estate around the world, including the historic headquarters of J.P. Morgan in Manhattan, held through a Delaware shell entity. Sam Pa may have now reached the end of the line. The man known as one of the shrewdest operators in politically unstable and volatile countries around the world has become a casualty of political upheaval in his home country. Thus far, one of the defining features of Chinese President Xi Jinping’s tenure has been an anti-corruption drive on an unprecedented scale in modern China. Although Xi vowed to go after both tigers (corrupt high-level officials) and flies (small-time crooks), many observe that the anti-graft campaign has largely targeted his political adversaries. Once a master of guanxi, personalised networks of influence, Pa’s relationships with the wrong Chinese elites may have been the key factor in his demise. The day before Pa was detained, party officials placed Su Shulin, Governor of Fujian province and former head of Sinopec Group, under suspicion of “serious violations”. Pa and Su had worked closely on deals in Angola, and Pa’s detention is reportedly linked to the Su probe. Although Sinopec lost a fortune in its deals with China Sonangol, Pa and his associates paid very little up front and walked away with a king’s ransom: a $51 million consulting fee for simply handling the paper work for the acquisition of five oil blocks and a corporate credit card that allowed Pa to spend HK$58 million ($7.5 million) over the course of several years. In Su, Xi may have ensnared a tiger. In Pa, he has trapped the lord of the flies. While Pa may be an inconsequential player in Chinese domestic politics, he is extraordinarily influential in several of the overseas kleptocracies he helped prop up. But his detention hardly means that justice will be served. One major challenge is the extrajudicial mechanism China uses to prosecute corruption. The Central Commission for Discipline Inspection, the Communist Party entity investigating Pa, is a secretive body, said to dish out “a harsh brand of party justice that’s often politically motivated.” Prosecuting Pa through this process would hardly amount to giving him a fair trial, depriving him and the victims of his schemes of the justice they deserve. Making an example of Pa may prompt some officials to think twice about engaging in graft, but the politically motivated nature of the purge could serve to undermine that deterrent, especially for Xi’s allies. But more importantly, Pa’s fall from grace is not a sign that the Queensway business model failed. The structural challenges and systemic loopholes that nurtured Pa and the Queensway Group’s rise in the first place remain intact. Predatory investors Sam Pa or Viktor Bout can still anchor their business in a jurisdiction that is unconcerned with its behaviour overseas, form companies without disclosing their identities, and target states with weak oversight structures and leaders who are more concerned with enriching themselves than delivering services to their citizens. Real progress against public sector corruption – in China or anywhere else around the world – requires far more than removing the perpetrators of abuses like Pa. The cornerstone of any effective anti-corruption strategy must be reducing the opportunities for illicit actors to operate in the shadows. This means ensuring that state enterprises and government budgets are governed transparently, and that civil society and the press are empowered to act as watchdogs. To ensure anti-graft campaigns are legitimate and sustainable, officials suspected of corruption should be tried through formal and transparent judicial processes, not ad hoc politically expedient tribunals. Unfortunately, China and many other places where Pa operated seem to be moving in the opposite direction. Still, there is a lot that reform-minded countries can do to bolster accountability in these states. Most importantly, they can eradicate anonymous shell companies. Without exception, every country should maintain a public registry of all companies registered within its territory. These registries must contain information about individuals who hold a substantial stake of the company, including their name, birthdate, residential address, nationality, and contact information. Falsifying this information should be illegal, and bankers who handle money for anonymous investors should also be held criminally liable. UK Prime Minister David Cameron has been a leading voice in advocating for these reforms, pledging to establish a public registry of British companies and vowing to go after “dirty money” stashed in the country’s property market. However, powerful interest groups are pushing back against legislation that would expand beneficial ownership transparency, and many countries and British overseas territories are refusing to get on board with reforms. When I caught wind of Pa’s detention, I got in touch with a colleague who encouraged me to look into Pa seven years ago. “Sam’s days were always numbered,” he told me. “If it doesn’t pan out this time, there will be another. His type usually ends up badly.” Pa’s demise was always inevitable, but a broken system allows his type to reappear. J.R. Mailey is author of ‘The Anatomy of the Resource Curse: Predatory Investment in Africa’s Extractive Industries‘, a Special Report published by the Africa Center for Strategic Studies. Follow him on twitter at @MaileyJR. Corruption is civic civil social corrosion creating only weakened institutions within a state which can ill afford civic weakened institutions. Corruption and corrupt practice only benifets the very few who occupy positions in the shadows. Government and systems of governance which condone, assist and maintain this administrative system of profound degredation to the majority of society must be hunted down and held to strict account as corruption and corrupt practice does lead to terrorism and violence. Therefore, corruption entailing corrupt practice can be considered as a capital offence with comcommitant sactions. Societies governed within an ethos of corrupt practice is a society not worthy of a name. If in doubt ask the malnurished children, ask the mothers pleading for medical assistance, ask the men who are seeking gainful employment in which to sustain a family.